So What Exactly Is YNAB? YNAB — Otherwise known as You Need A Budget — is probably one of the more popular budgeting programs around. It is mainly a desktop program but your account can be linked to your mobile device. YNAB is purely for budgeting, and it does it well. This app will simply let you look at the whole picture, all on one screen. YNAB was not originally created to be a widespread budgeting application for the general public. It was meant to be used by creator Jesse Mecham and his wife. The app ended up working so well for them they decided to release it to the public, with great success. YNAB is a desktop and mobile-based program allowing for static, and on the go budgeting. You are able to link directly to your bank account, or you can add your current funds manually if you feel uncomfortable entering your banking information. If you do decide to enter your account information, this program will work much better for you. If you have a husband, wife, or potentially even children you would like to teach the importance of money and budgeting to, the application allows for multiple budgets. YNAB’s interface not only teaches you these rules via videos, blog posts and free classes, but their programs allow you to execute these rules flawlessly. It seems like lot’s of people struggling with money today simply have the problem of not being able to walk the walk. YNAB’s system gives everyone ample opportunity to succeed. First of all, when we signed up with YNAB, we were pleasantly surprised with the tutorial to get you started. It seems like a lot of apps and programs these days tend to throw you to the wolves. You Need A Budget walks you through the initial steps of setting up your bank account, either with a manual entry or direct link. It then walks you through entering transactions, setting budgets for certain criteria, and moving funds to different areas when you over/under spend for the month. The sign-up is extremely easy. There is no credit card required for their free trial, which is a huge bonus in our eyes. Lots of companies rely on grabbing your credit card and hoping you miss your trial end date so they can charge. A simple name and e-mail will get you right into the action. YNAB offers a massive variety of bank accounts, which is something we have not seen in a few budget apps we have tested. Regardless if you live in Canada or the United States, they will more than likely have the bank you currently do business with. YNABs browser version of their program is simply amazing. The best part about it is there aren’t very many reasons you need to leave the main page. 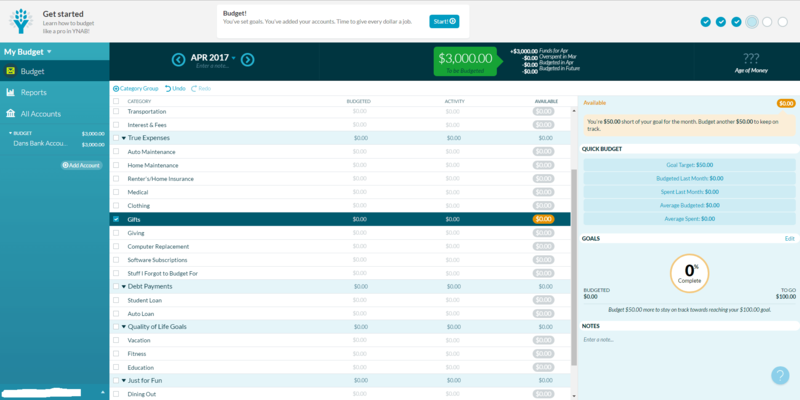 Add an account, modify your budgets, your certain categories, move funds from one category to the other all in one spot. No fumbling through multiple menu selections. YNAB’s simple yet powerful notification bar at the top that displays how much money you have left to be budgeted for the month, along with how much you have overspent or underspent. Want to know when a bill will be coming out of your account? Simply click the category that the bill pertains to and you will see upcoming transactions detailed on the right-hand side along with your budget for the category. Hovering over the upcoming transaction will list what account it’s coming out of, who the payee is and what date the money will be deducted. The biggest plus for us when reviewing YNAB is the fact you can do almost everything from one screen. After going through You Need A Budget’s desktop version the mobile version, of course, left something to be desired. Mobile functionality is not going to compare to a desktop platform but YNAB’s mobile app is still great. When you’re done signing in, you are greeted with the mobile dashboard. A simple yet effective display highlighting your current budget allotments to certain categories of your life. Clicking these categories will bring up any potential payments you have. Unfortunately finding when and where these payments are going isn’t as easy as the desktop version. In fact, we couldn’t find the option to view that information at all. Adding a transaction is simple from the main page. Simply click the button located at the bottom and enter the dollar amount as an expense, or income. Select your payee, or add one easily if you haven’t set them up yet.To finish it off simply select the category that the money relates to. We struggled to set up recurring payments on the mobile version, for things such as a car payment or mortgage. Therefore we would recommend using the desktop version to set these payments up. Use the mobile version for on the go purchases like gas, food etc is optimal. We found moving money from one budgeted area due to over/under spending to be a bit clunky, but it essentially works. All in all, YNAB’s mobile platform is great. You can never expect the functionality of a desktop inside the mobile program. 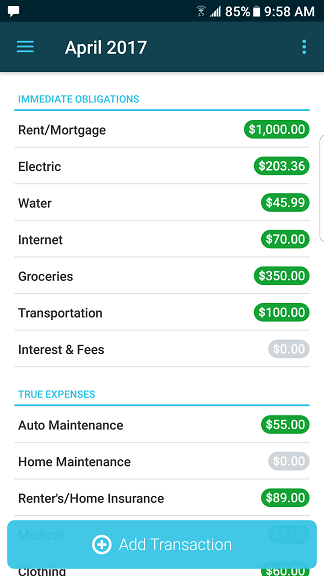 But for on the go budgeting and transactions, the mobile app is awesome. If you are struggling with the mobile platform, YNAB offers quick and easy access to their mobile manual right from the app itself. Most of all, did we mention that all of these extras are FREE ? YNAB seems to actually care about getting you on the right track, which is something you just don’t get from a lot of companies these days. Customers could spend days watching their large selection of Youtube videos dedicated to helping you budget better. Their help documentation solved any questions we had about the program within minutes. A budget is only as good as the person executing said budget. 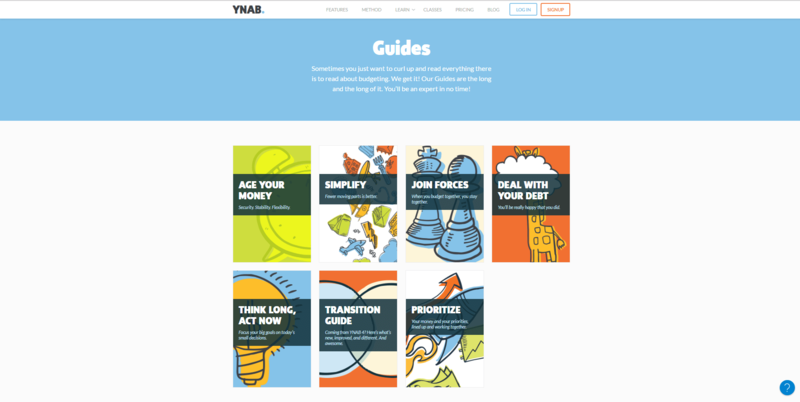 YNAB’s guides will set you up for success, there is no doubt about that. But don’t take our word for it, check them out here. We’ve tested and used a lot of budgeting programs. There simply hasn’t been a program that has delivered as easily as You Need A Budget. From the moment we signed up, the process was simple, easy and effective. Within half an hour we had our budget, transactions and bank account set up. Navigating the desktop platform was easy and getting from point A to point B is simple. In addition, help is available right from the desktop platform via search and will not navigate you away from your overview page. Therefore the questions we did have were solved without even having to open a new browser. Customers can enable tips to be displayed at the top of the page to guide you through the process of setting up your budget. Finally, we did experience a bit of clunkiness and general confusion when using the mobile platform, but that is to be expected. Do you run a small business? It’s easy to rename your basic categories to fit your needs. Do you estimate that by the end of the year you will need a new projector for your conference room? Just add it into your budget with a $50 monthly limit. Simply add in a $50 payment every month towards the projector and at the end of the year, you will have $600 budgeted to buy a new one. The projector only cost $400 in the end? Simply click the green oval on the right and move the funds into a different area you under budgeted for. The versatility of the program is endless. Personal accounts can be a great way to avoid going into debt. The program meticulously tracks your spending and alerts you when you may have overspent, or even underspent. As seen by the picture below, if you decide to go out and spent a little too much money, the program will reflect that in your budget. Unfortunately, we have overspent by 50 dollars this month and to balance the budget out, maybe we could consider moving some money from our Dining Out category and eat at home a little more often this month. Finally, because YNAB makes you manually enter transactions after spending, you are mentally aware of spending habits. This may seem like a burden to some customers, but it’s worth it. Spending money can be like breathing to some. You just do it without thinking about it. Having to enter transactions every time you spend makes you aware of exactly what you are doing. The program has multiple currencies and over 12 000 bank options that make YNAB a functional program for a wide variety of users. The 34 day free trial allows you to immediately jump into the program and explore its features. YNAB’s pricing guide is pretty simple. You get 34 days free, and it’s $50 a year moving forward. No “lite” or “pro” subscriptions to unlock more features. For less than a latte a month you have access to their platform, plus all the guides and workshops. As a result, we would almost guarantee that if executed properly YNAB will save you your yearly fee in the first month. As we have mentioned before, the company doesn’t grab your credit card information to start the free trial. This is a HUGE plus for us. You enter your e-mail address and your password and after inputting this information, within 5 minutes you’re entering your information into the platform. College students rejoice! 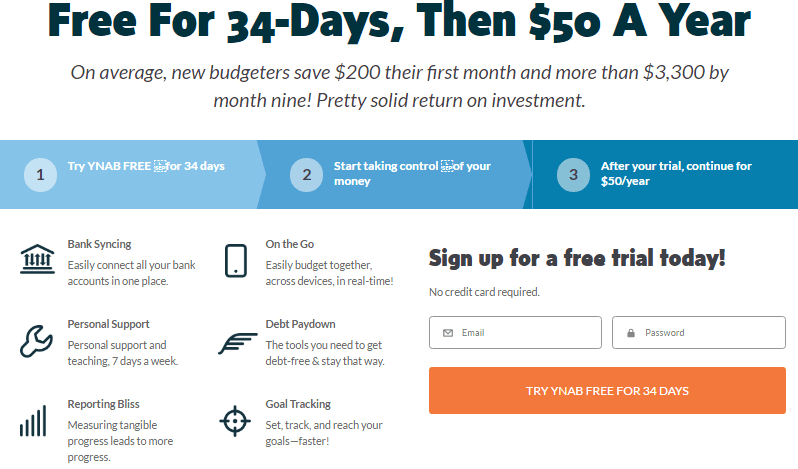 YNAB will offer you the 34 day trial plus one FREE year . All you need to do is provide proof via transcript, student ID card or tuition statement. After your one year is up, YNAB will give you a 10 percent discount to continue using the service. YNAB’s customer support and security we found are on the weaker side. They offer no phone support and even though we believe that method of communication is slowly dying with the incredible resources the internet has to offer we feel some people still prefer it. That being said, they have a plethora of online help guides on their website and we never really felt the need to contact them, our problems were quickly solved by following their set-up and question guides. To attach your bank account to your YNAB platform, you simply add in your username and password to your online banking profile and you are in. In today’s world, we feel that somewhat of an identity verification is almost necessary when you are dealing with banking information. When we first opened the account, we felt the ease of access into our personal banking information was just a little too easy.